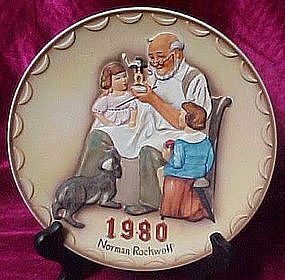 Limited Edition Norman Rockwell Plate - by Knowles, Gorham, River Shore and Others: Collectors Club Annual Series Toymaker Rockwell Collectors Club Plate. This is the First Annual Plate for the official Norman Rockwell Collectors Club, an edition limited to 90 days. It is a hand-painted bas relief 3-d plate on bisque porcelain. The depiction is of a toymaker holding a doll, with 2 young girls and a dog watching. Excellent condition--no box (bottom half of box included).